Then, I do another thing that is somewhat different than the traditional chutney-making-technique. 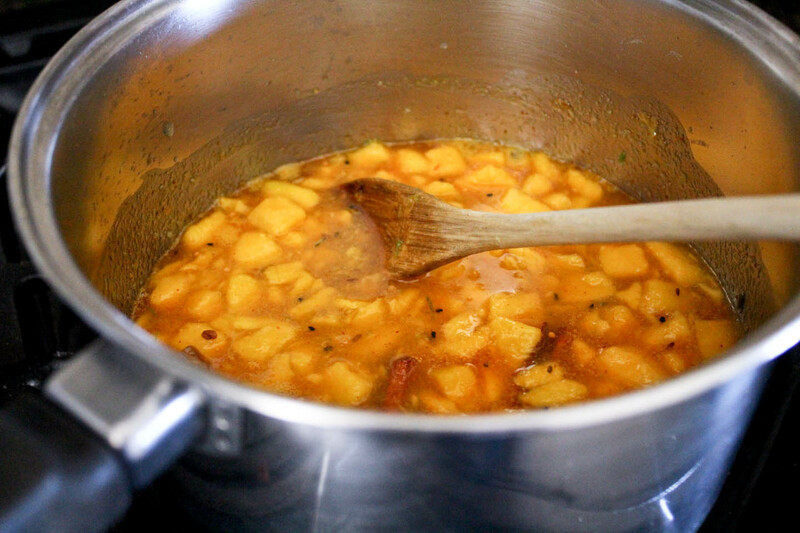 I toss the mangoes with sugar, a little lime zest and a squeeze of the juice. Then I set it aside and allow the fruit to macerate in it’s own juices for an hour or so. I love using this technique to make chutney because it really helps to draw out as much flavor as possible from the fruit. Also every time I macerate fruit, I’m instantly 10 years old again and sitting at my grandmother’s table. During the summer, she’d always plop a nice bowl full of fresh strawberries in front of us kids, sprinkled with a big heap of sugar. By the time the strawberries were eaten, they would have released their juices and you’d be left with a delicious, sugary strawberry syrup to slop up. Yum! Anyway, back to the chutney! This recipe is a combination of a couple different recipes. The first is a plain mango chutney–which was good itself, but definitely needed some improvement. The original recipe calls for 1.5 cups of vinegar to 2 pounds of mango. Now, maybe it’s just the fact that I’m not a huge fan of the taste of vinegar, but man…it was nearly inedible! I’ve re-worked it over the years and finally have the vinegar to mango ratio pretty much figured out. It’s so tasty and it’s always gobbled up right away! The other inspiration for this recipe comes from my stay in Kolkata and from mother-in-law. During Durga Puja last year, we went into Kolkata to see the immersion of the idols (I highly recommend you do this some day! It was incredible!). While in the city we stayed at this hotel called the Floatel. It’s located right on the river and just a short walk from where the immersions take place. They market themselves as an eco-friendly, floating hotel. It was a fun experience, and the food was really great! Included in their spread was this wonderful, flavorful chutney. I couldn’t get enough of it! My mother-in-law tasted it, told me what it was and said she’d teach me how to make it. And she did. Her version uses a block of mango paste–I’m not sure what it’s called, actually. We brought a few home with us from India, but I haven’t been able to find it at the markets here to replenish my stock. 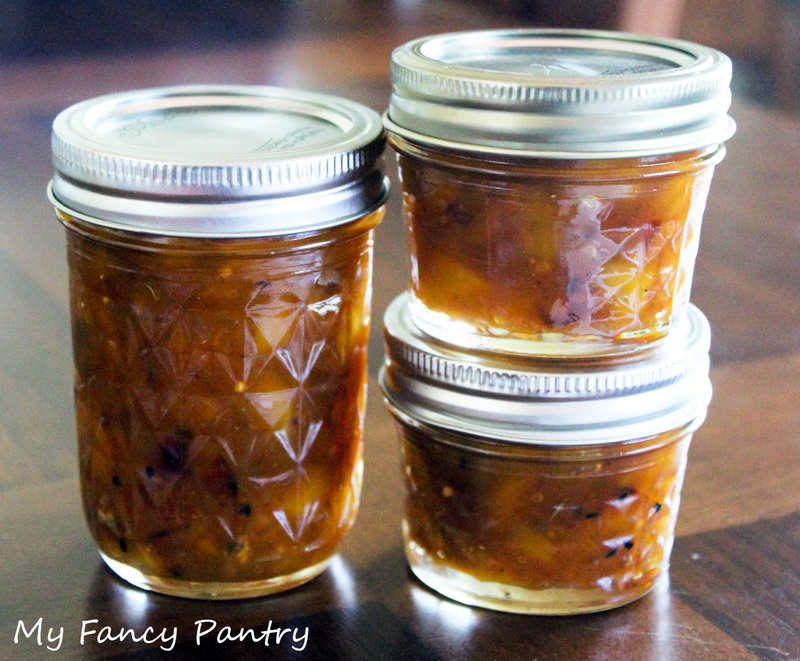 To make my version of this chutney, I started out by tossing a little sunflower oil in a saucepan. Once the oil got a little hot, I added some panch phoron (Bengali five-spice). 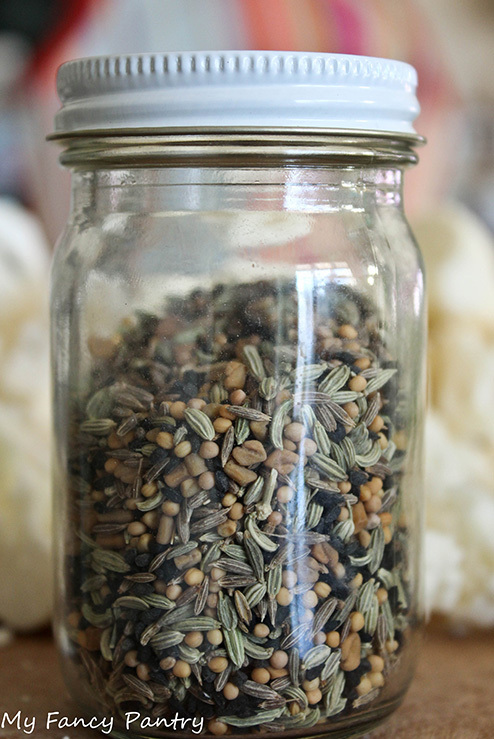 my jar of panch phoran consisting of fennel seeds, cumin seeds, fenugreek seeds, mustard seeds and onion seeds (kalonji seeds). I also added one broken stick of cinnamon and 5 whole cloves. Once the seeds began to crackle and the spices began to smell amazing, I tipped in some chili powder. If you like things really spicy, you could also toss in a couple dried, red chilies. In my experience, the dried, red chilies can really vary in hotness and can make something too hot rather quickly, so taste often and remove them if necessary. I let the spices cook for a little while before I tossed in a heaping tablespoon of homemade garlic and ginger paste. 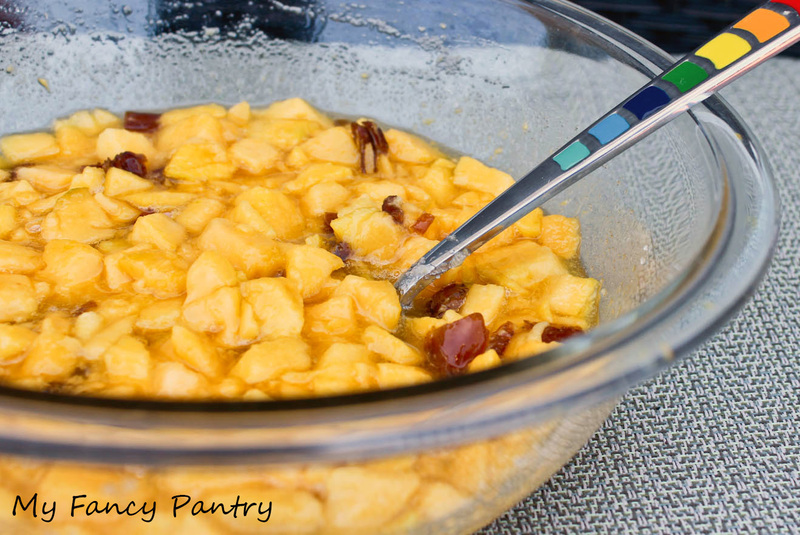 Once the garlic/ginger paste had cooked for about a minute and no longer smelled raw, I added about 1/4 cup of white vinegar and the macerated mango and date mixture. Now, you’ve just got to wait. It’s kind of like making jam but because you’re not adding any additional pectin, the mixture needs to cook on medium-high heat for nearly an hour. I usually walk away and do something else while it cooks, returning to stir it once in awhile. This time I got a little caught up trying to clean the temple. 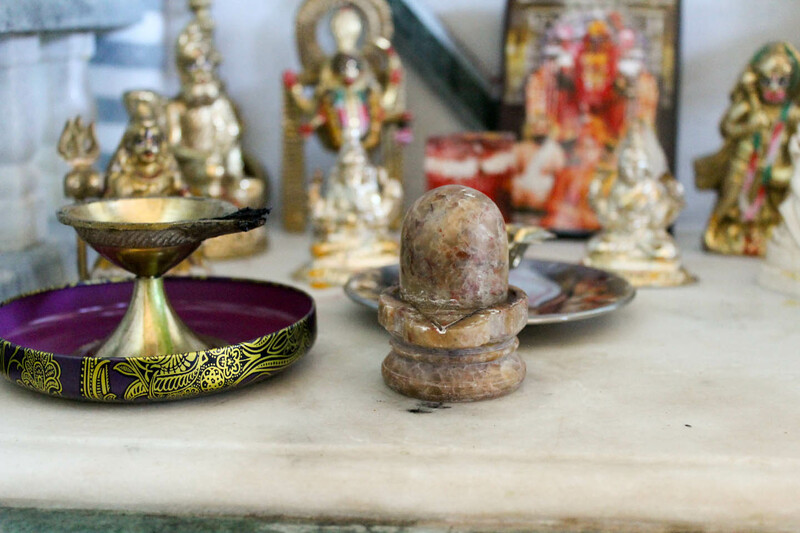 The marble easily stains and the oil from Piyush doing his puja tends to make things quite sticky. Usually it’s fine if I neglect the chutney while it cooks, but with the addition of the dates it really needs to be watched a little more closely. Dates burn fast. Trust me. I know this. The chutney is finished when the color becomes darkened and it really thickens up quite a lot. At this point, I took the chutney off heat and added about 1/2 cup of water to it because i thought it needed to be a little less thick. I just stirred it in, no problem! 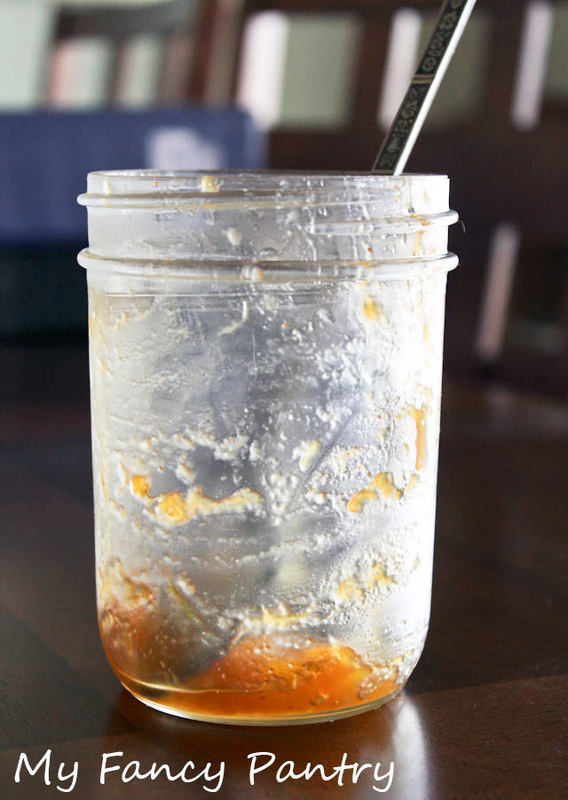 After the chutney was cooked, I transferred it to a few mason jars. Once cooled, I plopped on the lids and stored it in the fridge. Because I added vinegar, the chutney tends to stay well preserved for a few weeks in the fridge, if it ever lasts that long! I especially like it served with a few jeera papads at tea-time. Makes about 2 cups of chutney. Can also be frozen for up to 3 months in air-tight containers. This chutney pairs wonderfully with spicy curries. Especially meat-based curries. It is equally delicious with cheese and crackers or a simple Indian papad (papadum–a crisp circular cracker-like snack usually made from some type of lentil flour). 1/2 cup to 3/4 cup sugar (use your judgement. Depends on how sweet your mangoes are). Combine the diced mango, diced dates, lime zest, lime juice and sugar in a large bowl and stir to combine. Set aside for 30 to 60 minutes (or overnight if kept in the fridge). 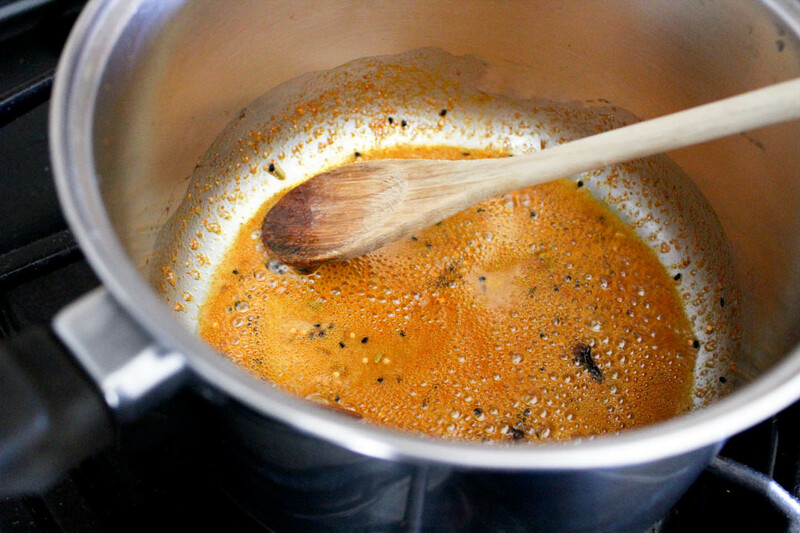 After the fruits have released their juices, heat some oil in a pan over medium-high heat and tip in the panch phoron, cinnamon and cloves. Once the spices begin to pop, toss in the chili powder and dried, red chilies–if using. 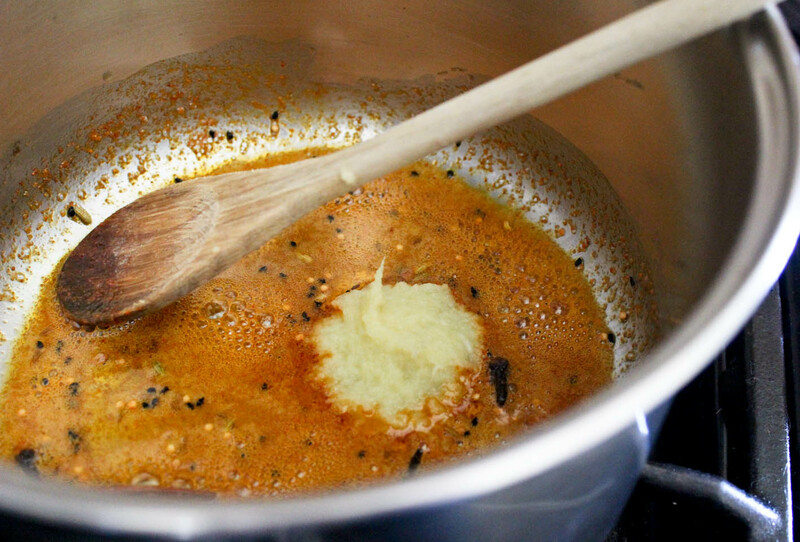 Stir everything together and once the spices no longer smell raw, add the garlic-ginger paste to the pan. Cook the garlic-ginger until they no longer smell raw, for about a minute. Once the garlic-ginger is cooked, add the vinegar to the pan and stir everything together. Tip in the mango mixture and stir to combine. Bring the mixture to a boil and then reduce the heat to medium. 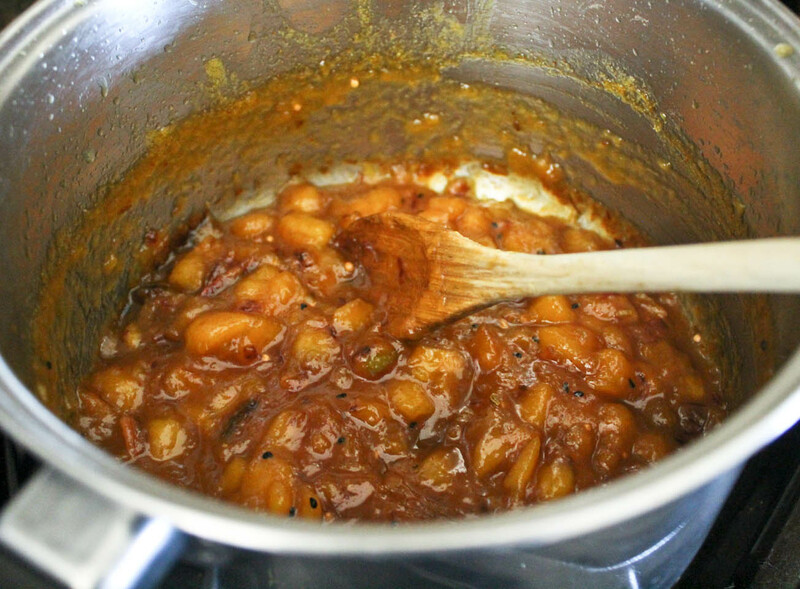 Cook the chutney for 45 to 60 minutes–stirring often–or until thickened. Remove from heat. If the chutney becomes too thick, add a little water. Start with 1/4 cup and add as needed. Toss in a pinch of salt…and you’re done! 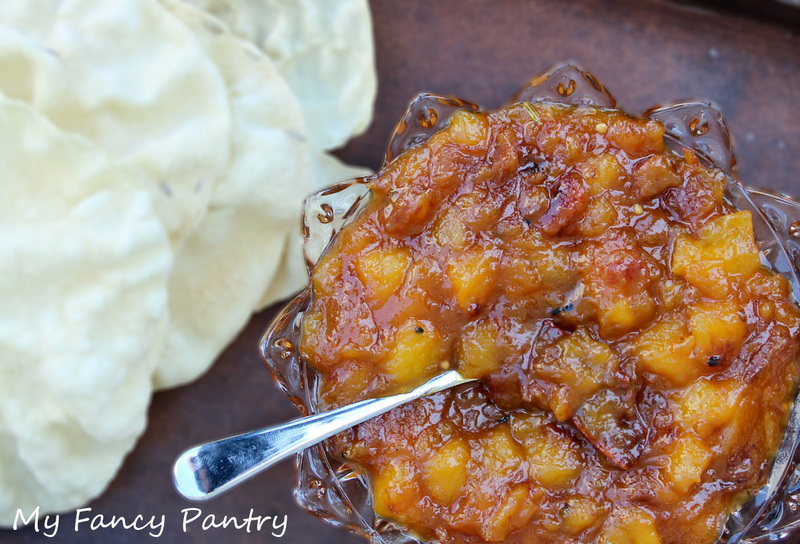 Nothing beats homemade mango chutney. The shop stuff is just too sweet. Wonderful! 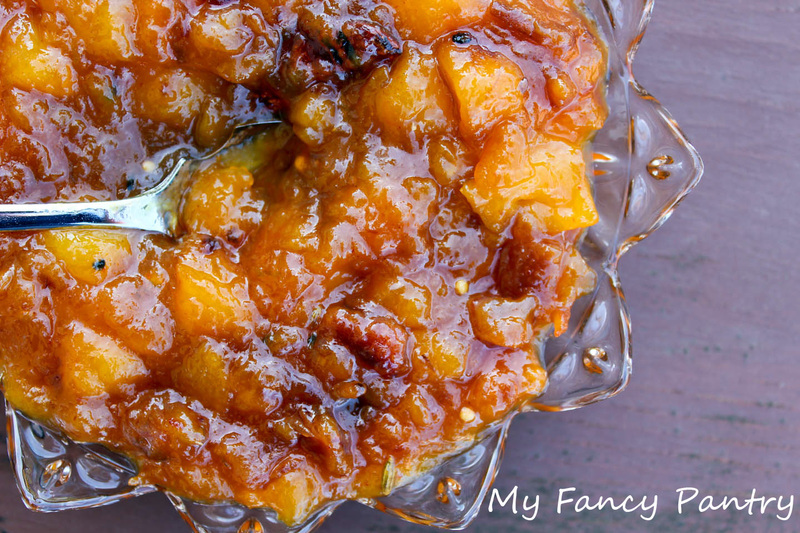 I love mango chutney, so I’m pinning this! Thanks for posting it – it sounds amazing!